If you’ve not had a gander at our New Additions page lately (if so, where have you been?!) you might have missed one of our brand new categories. 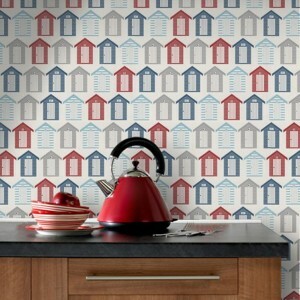 Red Candy is now a stockist of Graham and Brown wallpaper. Now you might be thinking that wallpaper isn’t at the top of the excitement tree, but you haven’t seen wallpaper like this before. Think gorgeous design, florals, cute illustrations and complimentary colours. This isn’t your mum’s chipwood wallpaper, this is wallpaper perfect for making a statement wall, or room…or home! Graham and Brown have also done a marvellous job of photographing some decor ideas for incorporating this cleverly designed wallpaper into your home. Have a look at three of our favourites below and let us know if there are any looks that you love in particular, oh and…don’t forget to pin! Proof that colourful can look just as good in the bathroom. Go for a nautical theme with the adorable Beach Hut Wallpaper and the Red Dotty Wallpaper. Who needs to be beside the seaside when you can take a dip in a bathroom as cute as this? Seriously pretty, this floral wallpaper has a lovely traditional colour palette of mints, pistachios and dusty pinks. The perfect pattern for creating a Parisian salon style feel in a bedroom, the Monsoon designed Isabelle Floral Wallpaper is inspired by 18th century French design. If primary colours are your thing then you’ll love the pretty butterfly wallpaper. Add colour to neutral room is one way to make a statement, the other is texture. This lovely Flutterby 3D Wallpaper will give you a bit of both. The brightly coloured butterflies are slightly embossed and raised from the pearlescent white wallpaper making a beautiful design feature for any room.